This a notary/corporate postmark used to officially apply to a piece of mail as it passes through the mailstream. It includes town data (Orlando) and was part of a process where postal workers would stamp markings indicating routing, directory service, postage due, censorship, registration, special delivery, forwarding, carriage by special transportation, etc. 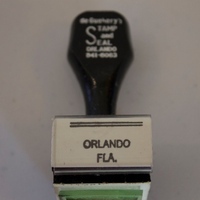 This particular handstamp was created by De Guehery's Rubber Stamp Company, which was located at 64 West Robinson Street in Downtown Orlando, Florida, and is now known as Orlando Rubber Stamps and Sign Company. “Postmark Handstamp.” RICHES of Central Florida accessed April 21, 2019, https://richesmi.cah.ucf.edu/omeka/items/show/5578.